Although there has been something of an east/west divide, with the west faring by far the worse, nowhere seems to have escaped unscathed and great swathes of the country are facing extremely challenging conditions. Higher lying areas have seen a number of avalanches, road closures and problems with ice whilst lower lying areas are having to deal with flooded rivers and high tides causing floods at the coast too. How ironic then that due to a lack of snow the Golden Fox Women’s Ski Cup competition was moved from Maribor’s Pohorje, where it is usually held, to Kranjska Gora, where on Friday 200 workers, many of them volunteers, battled through the night trying to pull off the almost unhuman feat of clearing up to 2 metres of snow to get the course ready for Saturday’s competition. And they almost succeeded too but in the end nature won, sense prevailed, and Saturday’s event was cancelled at the last minute due to fears for the safety of competitors, especially with the winter Olympics in Sochi only a week away – for many, the risks would have just been too great. This sadly adds another blow to a pretty dismal season for Kranjska Gora. Looking on the bright side though at least now, hopefully, once conditions normalise and stabilise again, they, together with the other Slovene ski resorts, will be able to make full use of the abundance of snow for the remainder of the season. And of course for lovers of all things ‘winter’, both locals and tourists alike, the winter season looks set to be extended and there will be no shortage of skiing, sledging, snowshoeing and the obligatory snowmen making. This morning I set out to try and take some photos of the snow to post on this week’s blog; some kind of arty, snowy, winter wonderland scenes. However, I was defeated on a number of accounts. Firstly, since the cloud is currently so low that one can’t even differentiate between cloud and sky, everything is just white; additionally at the moment it really doesn’t look all that picturesque, more of a mess really, the sheer number of fallen trees is staggering and heart breaking to see, oh and add to that the fact one can barely walk anywhere as the pavements STILL haven’t been cleared (why?). So instead I thought I would attempt to describe some of the scenes and challenges of daily life at these extreme times. After all, there will no doubt still be plenty of opportunities for snowy photos in the weeks and months to come! 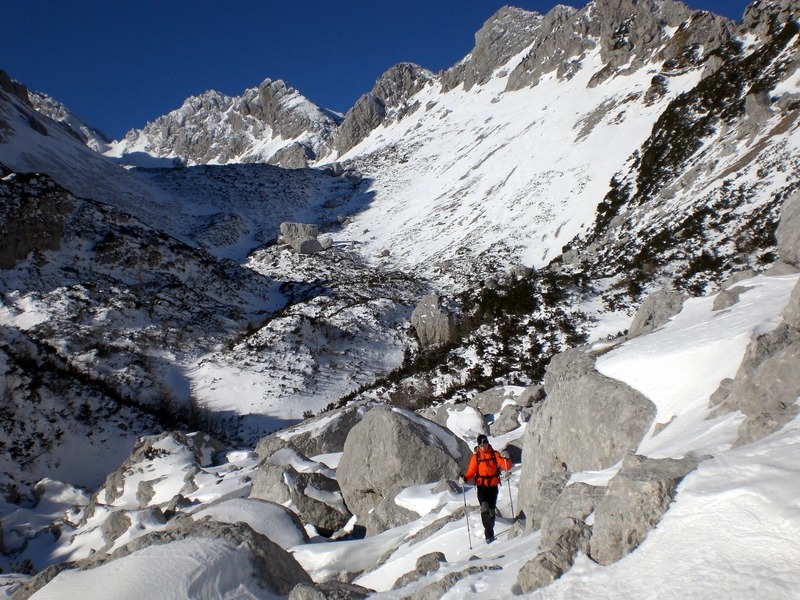 But I can’t write a blog entirely without photos so I’ve included a few from some of my previous winter hikes to offer a reminder that ‘snow can be both fun and beautiful’ as my Slovene friends are always quick to remind me! Here I am during a hike in the Karavanke range, headed from Srednji vrh towards Zelenica. Even mundane chores, such as taking the rubbish out, become nigh on impossible. I was witness to this today when I watched someone first use a shovel to clear a path to the rubbish bins, having done that they then had to clear the snow from the top of the bins, only to find that the bins were firmly sealed shut by ice – mission aborted. Hospital admissions have been soaring due to falls on the ice resulting in sprained and broken limbs and some pretty impressive bruises. Family recreation time takes on entire new meaning involving the whole family out shovelling snow and/or chiselling away at ice in a vain attempt to clear their driveways, pavements, cars…. All the major passes from Slovenia into Austria are closed, meaning the only way to reach Austria, from this part of the country, currently is through the Karavanke tunnel and the only way to reach the Soča Valley is the (very) long way round. A huge number of roads are closed, due to fallen trees. Heavy goods vehicles are prohibited on most major roads. The military have been called in to help. The PM visited some of the affected areas today, as world leaders tend to do as such times to ‘offer their support’. Train travel is also severly disrupted however air travel remains unaffected and is operating as normal. Out of my window I’ve been watching people standing on step ladders in order to be able to reach the snow on the top of their cars, people perched precariously on rooftops shovelling the snow off in order to avoid roof cave ins. I could go on, but hopefully by now you get the point. If nothing else, these times certainly unite people, provide an opportunity for neighbourly ‘bonding’ and provide some useful calorie burning activities! I’m certainly very grateful to my neighbours for helping to clear the snow off my balcony roof which was starting to sag under the weight of the snow. I’m also very thankful to a friend who, on hearing the desperation in my voice, gently coaxed me out for a walk yesterday. Those that know me will attest to that fact that I never usually need encouragement to go out for a walk – quite the opposite in fact. Of course it will impossible to assess the true extent of the damage until conditions stabilise and access can be obtained to the worse affected areas. Neighbouring countries have already offered help to Slovenia and with outside help plus a great deal of hard work all round of course we will recover and temperatures look set to rise during the course of the week so hopefully conditions will begin to improve. People often ask me why I remain living here, in this alpine region of Slovenia, especially when I’m not a fan of snow and, if I wasn’t a fan of snow before, then this latest episode has only served to heighten my dislike of it. I must admit at times like this I do sometimes question my wisdom but the truth is that despite the often harsh long winters, there is still something special about this little corner of Slovenia that is now my home and therefore I just have to take the rough with the smooth and look forward to warmer, sunnier times ahead. 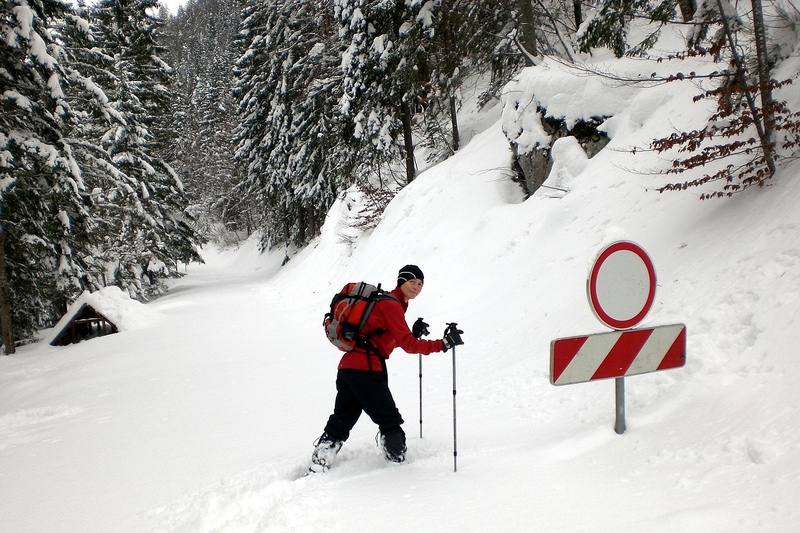 Here I am snowshoeing last year in the Vrata valley! This coming Saturday, 8th February, is a national holiday in Slovenia – Prešeren’s Day – named after the great Slovene poet, France Prešeren (1800-1849), born in nearby Vrba. There are events held all round the country to mark the day. 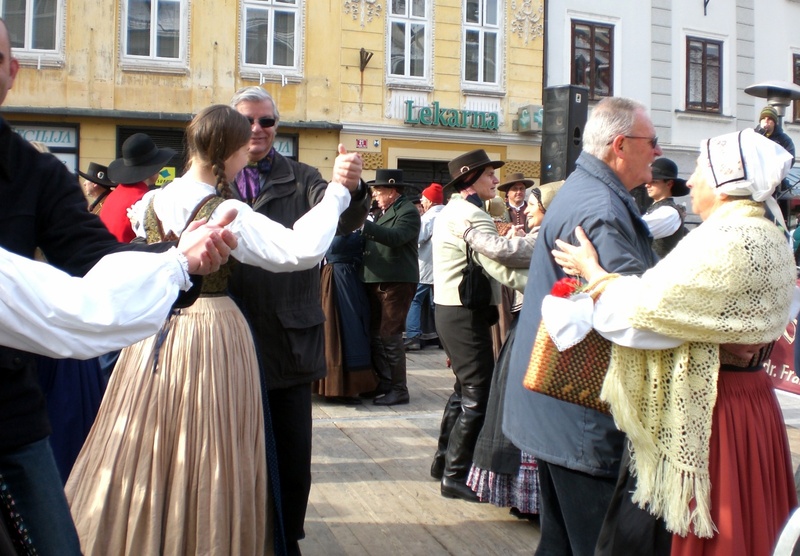 Weather permitting, I usually like to attend the Prešeren Fair in Kranj, where the streets are lined with stalls selling various handicrafts and wares and the old town centre comes to life with music, traditional dances and people dressed in clothing from Prešeren’s time. Here’s a photo I took at last year’s event – note there’s no snow! In Radovljica there will be a ceremony on Thursday 6th at 7pm in the Mansion House (graščina) and on Saturday 8th visitors can take advantage of free entrance, from 10am to 3pm, to the Museum of Apiculture and the Town Museum in Radovljica and the Blacksmiths Museum in Kropa.